We are known in the market for providing Plywood Export Boxes shaped in various sizes to meet the rising needs of the market. Our products are largely acclaimed for their optimum quality and high reliability. These are made of superior grade materials and are secure to use. They are supplied all across the nation for shipping purposes at reasonable market range. 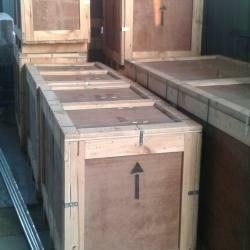 We have emerged as one of the leading manufacturers and suppliers of Plywood Export Boxes, which are largely used for packaging various consignments. These are offered in various shapes, sizes and customized deigns as per our clientâ€™s requirements.